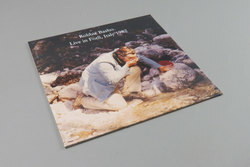 Robbie Basho - Live in Forli, Italy 1982. Vinyl LP. Bleep. Huge news for all devout Basho fans! It surely can’t just be us. ESP Disk rescue this fractured live recording from a time-forgotten Italian concert and it’s a dream for anyone slightly obsessed with this folklore maverick. We hear a raw and intimate Basho, perhaps even unaware of the fact he is being recorded, conversing with the crowd and adding improvised variations to classic compositions such as ‘Song of the Stallion’. Another huge highlight comes in the form of ‘Cathedral et Fleur de Lis’. We didn’t see this one coming! A real must for the completists but a lovely document all the same.